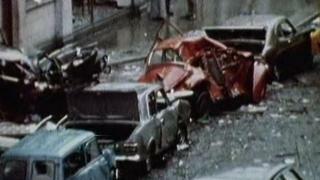 The victims and families of those who died in the 1974 Dublin and Monaghan bombings are to sue the British government in Belfast. They claim the attacks were carried out by loyalists with government collusion and that there was a cover-up. Thirty-three people, including a pregnant woman, were killed and almost 300 people were injured when the bombs exploded without warning. The families are taking a civil action in the High Court in Belfast. The action is being taken in the names of Derek Byrne, who was seriously injured in one of the three Dublin bombings, and Paddy Askin, whose father, Paddy, was murdered in Monaghan. Belfast solicitor Kevin Winters who is working with the families says the action is being taken against the Ministry of Defence, the PSNI Chief Constable and the Northern Ireland Secretary. Three bombs exploded in Dublin on 17 May and one in Monaghan. The deaths were the biggest loss of life in one day in the Troubles. Nobody has ever been charged in connection with the attacks. It is alleged that loyalist paramilitaries, the Ulster Volunteer Force (UVF) carried out the attacks with the knowledge and assistance of elements of British security and intelligence services in Northern Ireland. Mr Winters, solicitor for the Justice for the Forgotten group, which represents the survivors and victims' relatives, said: "The families for many years have made the case consistently that the authorities went out of their way to protect individuals, suspects who were involved in these killings, involved in planting the bombs in both Dublin and Monaghan and at the root of the case is the families' desire to expose that. "At least two known agents were protected and given, if you like, a de facto immunity from prosecution. That's a very serious allegation, it's an allegation which has never been ventilated in a proper criminal process or proper investigation. "The investigation that should and ought to have taken place didn't take place - and that's an appalling travesty for these families. "This civil action in part is designed to try and compensate for that ultimate failing on the part of the government and the various authorities and agencies who were tasked with the investigation into Dublin-Monaghan and didn't do it." Relatives of those who died said the case was a last resort in their attempt to secure answers. Bernie McNally who survived the Talbot Street blast in Dublin but lost the sight of one eye said: "It's so important to get answers for all the families particularly those who lost their loved ones. "I know it's not going to bring back family members and loved ones. But it just will give some source of comfort maybe to people. I don't know, I haven't lost anybody, but I just imagine you need to find answers. I would like answers for myself." A 2003 report by Mr Justice Henry Barron, formerly an Irish Supreme Court judge, said there were grounds for suspecting the bombers may have had help from members of the British security forces, but there was no conclusive proof.